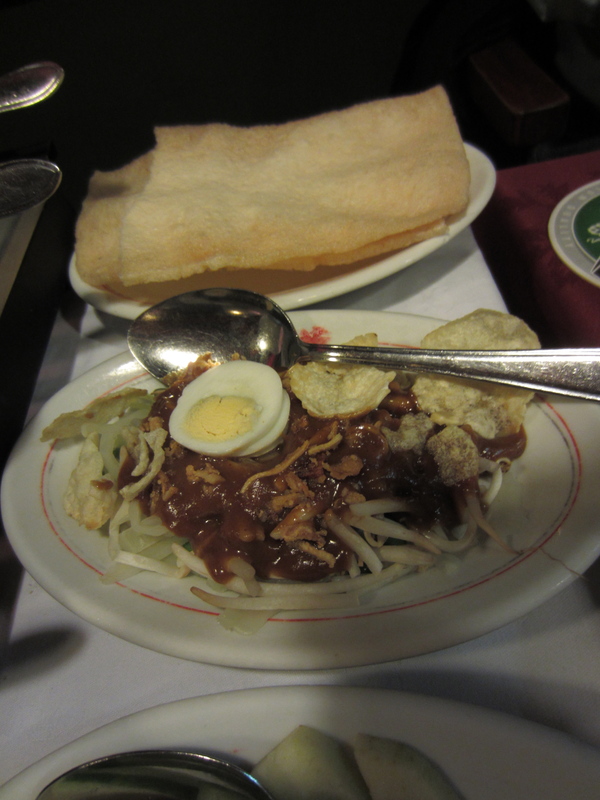 During our trip around Amsterdam, I’d read a lot about the many Indonesian restaurants in the city. 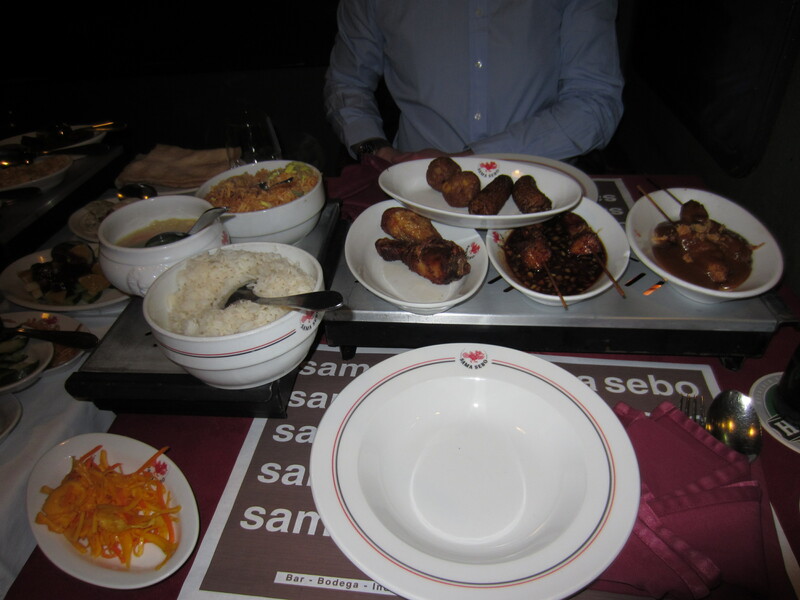 We’d seen a place called Sama Sebo when we were visiting the Rijksmuseum and decided to try it out. I’d already had a look on its website to check out their menu and it said it’s normally fully booked, so the need for booking was paramount. Despite this, we went on spec to see if we could be squeezed in, luckily we like to eat dinner quite early. 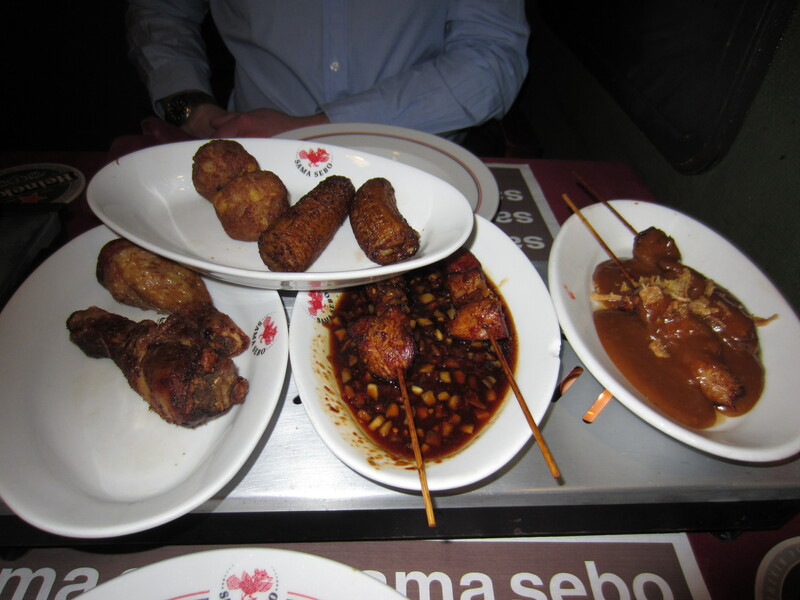 Sama Sebo is one of the oldest and arguably most famous of the Indonesian restaurants in the city. On entering the restaurant you walk straight into the bar area, which was already quite busy, there was one table left in the corner so we happily sat down. It quickly seemed obvious how popular this place as a large group of people came in and took over the back room for a large dinner party. 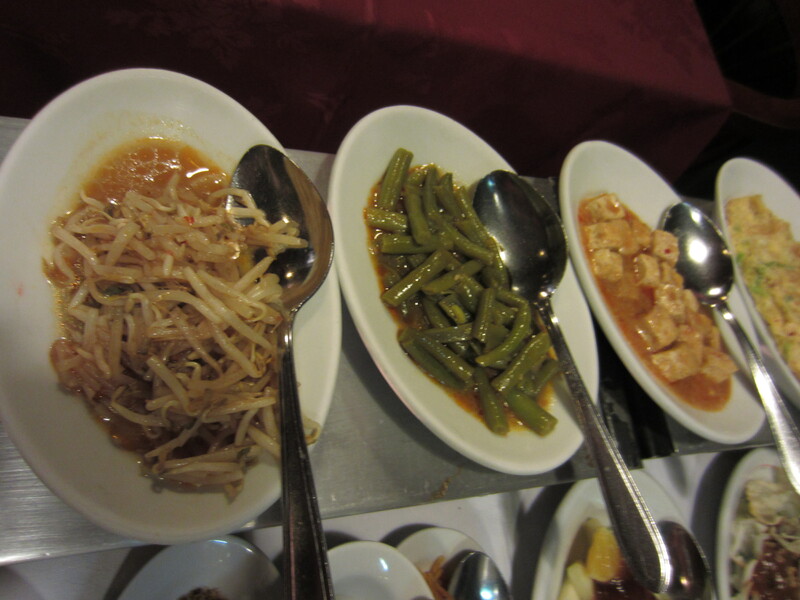 The restaurant has a lunch and a la carte menu, but specialises in something called the Rijstaffel (rice table), where there are different rice dishes and a large number of side dishes. The a la carte menu had no english translation, but the Rijstaffel menu did; so due to our lack of Dutch we decided on the latter! A few minutes after our order was taken 4 plate warmers were carefully arranged on our table, giving us an idea of how much food would be on its way. 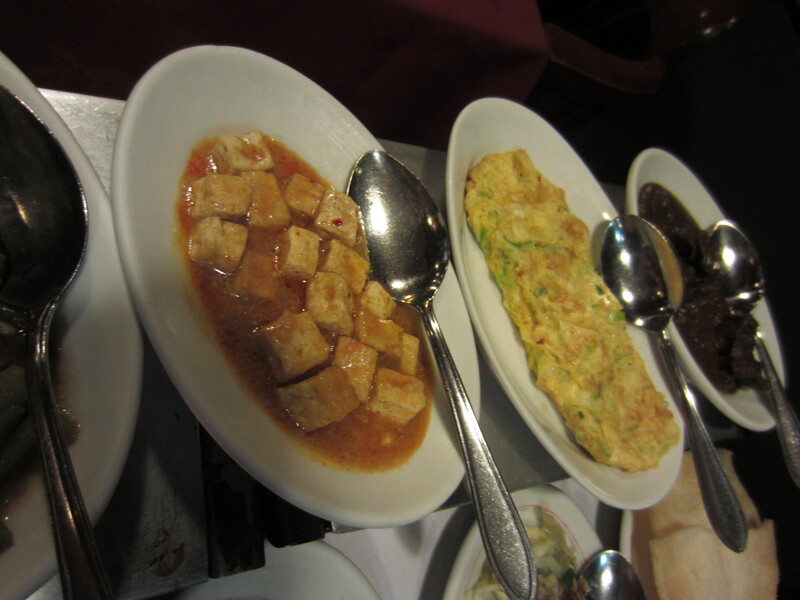 After approximately 10 minutes the dishes started to come out, the waiter very efficiently brought out the bowls of rice, fruit, vegetables and other condiments; finally followed by the meat dishes. There were so many dishes that some had to be balanced on top of two other dishes so they could all fit! So where to start, that was the most difficult thing to decide on, there was so much food! In total the table was covered with 20 different dishes. hot peppers, rice, vegetable soup, chicken drumsticks, meatballs, roasted pork on sticks, chicken on skewers and fried banana. 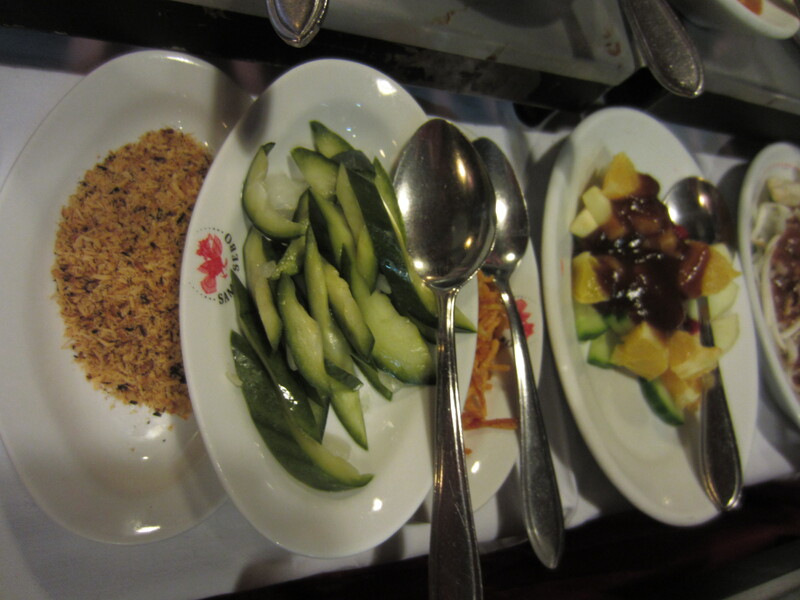 sweet and sour fruit, sour cucumber and fried coconut. vegetables in a peanut sauce with boiled eggs and giant prawn crackers. Being a hard and fast carnivore I went straight for the meat dishes, there were roasted pork skewers, marinated chicken drumsticks and chicken on skewers and meatballs. The rice was flavourful and al dente as I like it, one was plain boiled rice and there was another that looked to the untrained eye like an indonesian egg fried rice. The meat dishes were very well cooked, soft and tender and the chicken drumsticks fell off the bone and had tonnes of flavour (very moreish). The meatballs didn’t last very long and the skewers had a delicious sauce, the vegetables all seemed to compliment the rice and meat dishes. I initially found this hard to understand because of the wide variety of side dishes. But as I ate them I seemed to get why they had been chosen, each adding a different dimension to the food and enhancing the flavour. There were some huge prawn crackers which were lovely and crisp, not too intense in prawn which was good. 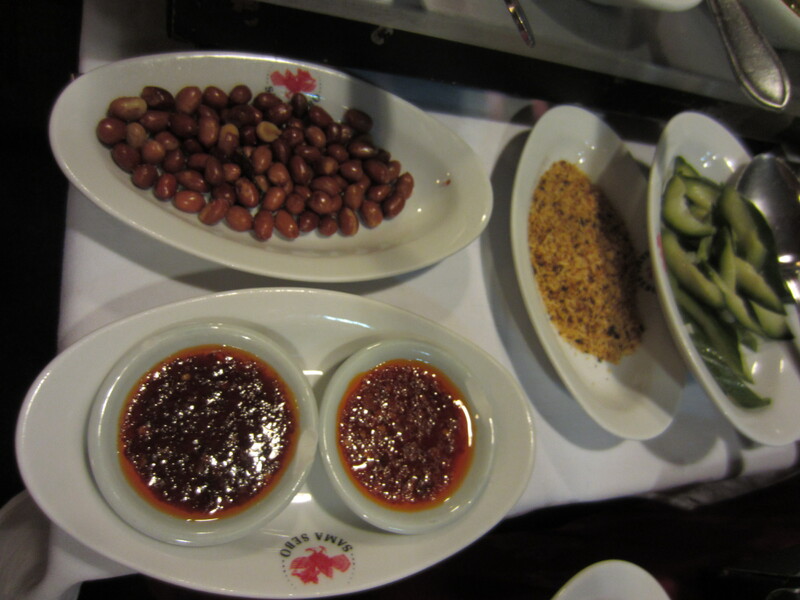 The condiments included sour vegetables, sweet and sour fruit, hot peppers, peanuts, tofu, chilli sauce, even fried bananas and coconut. All were really delicious except the banana and peanuts, just because I have a personal hatred against these. I was told by my fellow diner that they were actually very tasty! There was even a bowl of soup containing some sort of broth with mixed vegetables. Just beware of the chilli sauce, just go for the oil as the pieces of chilli were found to mightily powerful!! 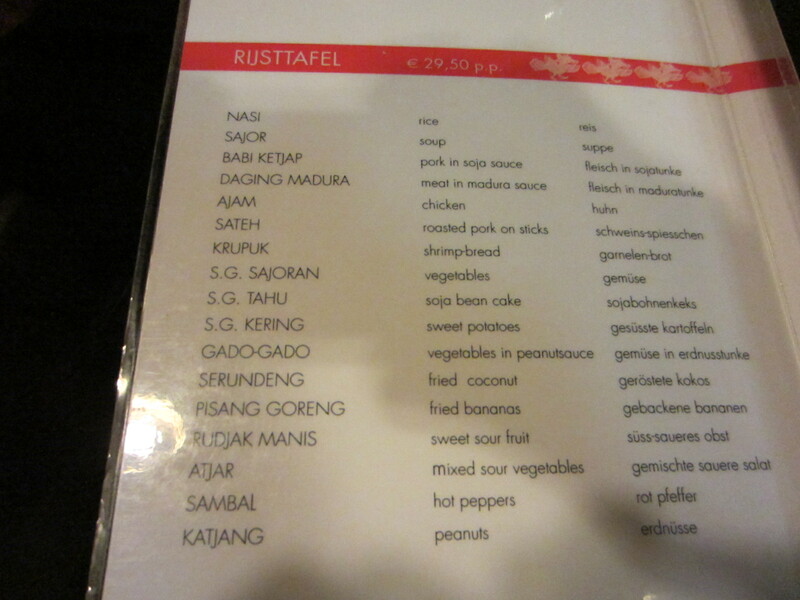 As we ate we could see that the Rijstaffel was a popular choice, more tables around us had ordered it also. As we emptying finished our dishes and were in less need of the plate warmers, they were being taken away by the waiter and placed on someone else’s table in readiness for their dishes to arrive. The Rijstaffel was €29.50 each and with drinks on top was still very reasonable, considering the amount of food and more importantly the flavour! The place had a nice atmosphere and was popular with locals and tourists alike. If I wanted to eat a little later in the evening, I would definitely say that booking was advisable, because when we left the place was packed.